Aces and Eights is a video poker game that's been around for quite some time. The game is named after the famous "Dead Man's Hand", consisting of a pair of Aces and a pair of Eights, held by "Wild" Bill Hickock at the time of his death back in the 1870's in Deadwood, South Dakota. 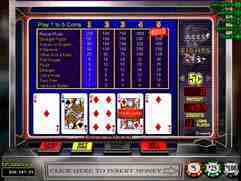 Aces and Eights is similar to popular video poker games such as Jacks or Better, and Aces & Faces. Both of those games pay out higher wins for recording specific four-of-a-kind hands, and Aces and Eights follows in this pattern by paying out higher for four-of-a-kind hands made up of Aces, Eights or Sevens. In comparison to Jacks or Better (Full Pay), Aces and Eights (based on Real Time Gaming casinos' pay tables) pays out better on four eights, four sevens, and four aces, while paying out lower on hands consisting of either a Full House or a Flush. A player's expected return in Aces and Eights is approximately 98.6%, which is slightly lower than Jacks or Better, but still exceptionally high in comparison to most other casino games. Aces and Eights can played at a variety of online casinos, most notable Microgaming and Real Time Gaming casinos. Microgaming casinos feature bright, vivid colors, with electronic-sounding audio enhancements. A nice bonus of playing this game (or any video poker game) at a Microgaming casino is that you'll be provided with a statistical reference box that keeps track of your overall won-loss record. Real Time Gaming's video poker games on the other hand, consist of sharp, realistic graphics, as well as older-looking video poker machines that will take you back to a mid-1990's Las Vegas-style casino. The one difference that we've noted between Microgaming casinos and Real Time Gaming casinos is the discrepancy in this game's pay table. Microgaming casinos seem to offer a consistently higher pay table for the most part, but this isn't to say that Aces and Eights video poker games found at Real Time Gaming casinos are not worth checking out. They still offer reasonably advantageous pay tables, as well as the luxury of offering many of RTG's generous bonus promotions. Always hang onto a winning hand unless you've got four cards to a Royal Flush, or three Aces. If you’re looking for a great place to play Aces & Eights Video Poker, we highly recommend trying out Silver Oak! This reputable online casino is powered by RTG and they have one of the best video poker selections available online. If you act now, you can get up to $10,000 in free casino money when you make your first deposit to play Aces & Eights Video Poker at this respected online casino! Another great place to play Aces & Eights Video Poker is none other than the popular Slots Plus Casino! This trusted online casino accepts players from around the world; including players from the United States! For a limited time, all new players at Slots Plus Casino are eligible for a free $25 no deposit bonus and up to $3,000 in free video poker money when you make your first deposit! Take advantage of these great offers today before it’s too late! Vegas Crest Casino, a new and exciting Rival powered casino, is currently giving away one of the best video poker bonuses in the online casino industry! Right now, all new players can get a 300% signup bonus worth up to $3,000 in free casino money when you make your first deposit! You can use your free casino money to play Aces & Eights Video Poker or any of their other great video poker games! How does $10,000 in free casino money sound to you? If it sounds too good to be true, we’re here to tell you that you’re wrong! At Vegas Casino Online, a popular RTG powered online casino, you can get up to $10,000 in free casino money just for making your first deposit! This is by far the biggest casino bonus around and you can use it to play all of your favorite games; including Aces & Eights Video Poker! Head over to Vegas Casino Online today to claim your free bonus!